This new-wave tactical bag is the next evolution of the bag trend for dudes. Small crossbody bags for men are one of the biggest menswear trends of 2017. Whether they're $10 fanny backs slung across the body or ultra-hyped Supreme x Louis Vuitton versions, this was the year dudes finally got over their "man purse" apprehensions an embraced small bags for good. But if there are two people who can really kicks the trend into overdrive, it's Kanye West and A$AP Rocky. But these two trendsetters have taken the cross body bag to a new level by rocking the same bag by upstart fashion label Alyx. Alyx, which is helmed by Kanye West collaborator Matthew Williams, made a bag earlier this year that straps around your back and over your head, making it somewhere between a vest and a bag. (We're open to name suggestions, by the way.) We can't imagine carrying anything bulk in the pouch would be a smart move (it might give you a kind of Iron Man chest piece vibe), but for your wallet, money, and phone, it seems just as practical as your average fanny pack or satchel. Additionally, West and Rocky both show you that no matter what the season, a bag like this is always a way to add a sprinkle of futuristic tech style to your look. Unfortunately the Alyx bag is sold out pretty much everywhere, but a similar style can be picked up at your local Army Navy store for around $25. this season Alyx debuted a new multi-strap bag, which goes around your body and over one shoulder. 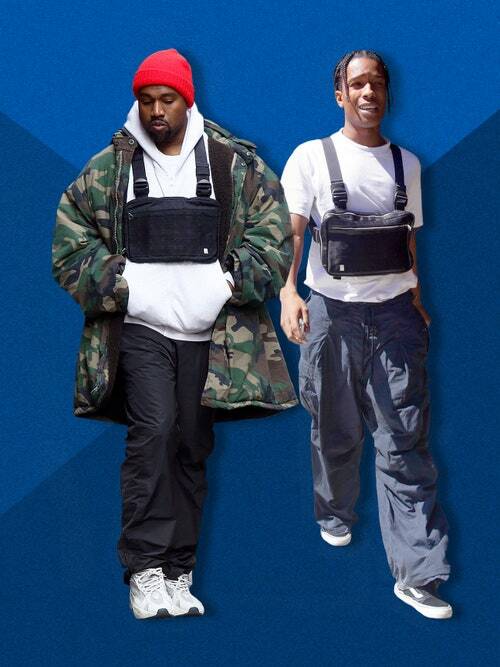 Point is, now that guys are getting used to the idea of bags period, and with the help of Kanye West and Rocky, the next wave of bags is here.